Recently, as part of my day job, I was on a management training course. As part of that, we were divided into teams and asked to produce a short presentation on a management-related theme each team was given. 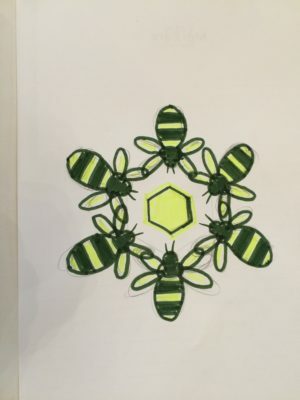 The team I was in was given ‘Teamwork’. 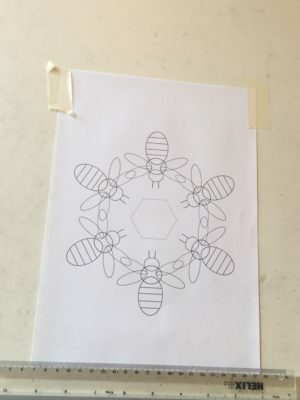 We decided on a metaphorical approach, using bees and how they work together for the good of the hive. It’s a bit rough, but I did only have a few minutes to draw it freehand with marker pens, so it didn’t turn out too badly! In fact, it turned out well enough for me to want to stitch it. I’ve used this to line the fabric that’ll form the background of the finished piece; the linen is on the back. As well as providing a handy way of transferring the design without marking the finished fabric, it also adds strength to a fine fabric, meaning I can stretch it on a frame without worrying. Next time, I’ll transfer the design to the front of the fabric, and start stitching. 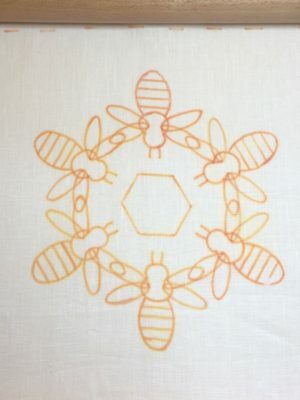 This entry was posted in Designing, Transferring a design to fabric. Nice! Will you be adding some gold work? It certainly cries out for it.